Even though I am a conservative at heart, my favorite newspaper is the New York Times. They have always been the one newspaper that is actually trying to do a good job – until now. I recently converted my digital only subscription to digital plus Sunday delivery and I have been surprised to see twice in the last month that the China Daily has purchased two page advertising spreads in the Sunday edition (these advertisements do not appear in the digital editions). China followers are quick to dismiss this a as a cheap trick, but those who are less likely to realize the extent the Chinese government (who prints the China Daily) will go to deceive its readers will not. I am surprised that there has not been more of an outcry from the protectors of Journalism. Is this old news or something? Here is the only article I could find. Just as Goldman Sachs will likely be successful with its new philanthropy campaign, the Chinese government will likely win over many readers with its New York Times partnership. Until now I had hoped there would be customers who the New York Times would actually not take money from. We should all brace ourselves for what comes next, because if the precarious state of the newspaper industry has brought us this, next we will get something even worse. If there is a newspaper with a “Chinese wall” (ha ha) between advertising sales and editorial decision making, it should be the New York Times. Recently, this article appeared. I wonder what kind of phone calls it generated. Michael Lewis recently pointed out in Boomerang that Germans by their nature believe in order and process and cannot escape the idea that everyone else does too. When Moody’s said that the bonds were AAA – the Germans actually believed it. When they turned out to be toxic junk – the Germans were actually surprised. The Chinese believe that their paper is full of lies, and when they find out that Americans actually believe what is printed in their paper – they will be surprised. The Chinese also believe that when you pay someone money, they do what you ask them to do. 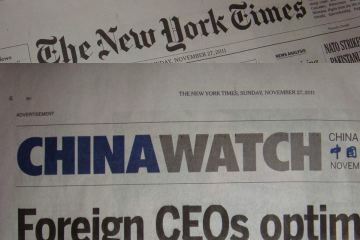 So when the China Daily calls up the New York times and asks that they no longer print negative articles about China – they will actually be surprised when the New York Times says they will not. Well, I am still a subscriber. But I will be getting my China news somewhere else. Anyone have any suggestions? Al Jezerra English? Update: Post from the Nieman Lab at Harvard on the subject.